Submitted to The Triangle by John Favelle, January 2016. On November 10th, 2012, I was browsing through the Sydney Morning Herald newspaper which my daughter had left with us after a weekend visit. 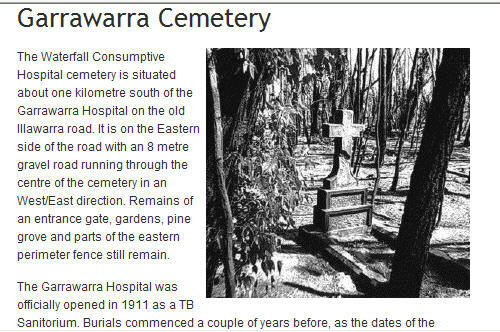 In the paper was a story about a Conservation Plan for a rediscovered cemetery near the Garrawarra Hospital at Waterfall, near Wollongong. 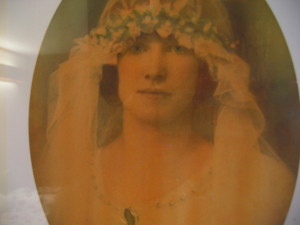 I have always known that my mother, Margaret “Josephine” Hyland nee Stewart was admitted to Waterfall, a tuberculosis (TB) sanatorium, and had died there. Throughout my life, no one has ever mentioned where she had been laid to rest. From reading the newspaper, a chain of events quickly fell into place. 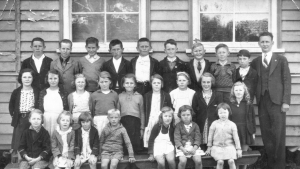 I have records that indicate that I was placed into the Ashfield Infants’ Home on the 28th of July 1933 at the age of 5 months where I lived for some years. 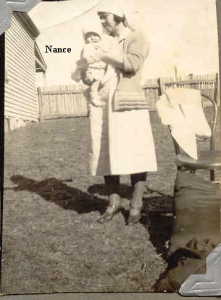 I had no idea that the 28th of July 1933 was the same fateful day that my mother, who was terminally ill with TB, had been admitted to the Garrawarra Sanatorium at Waterfall. It was a Friday and must have been a very horrible and terrifying day for my very ill mother. 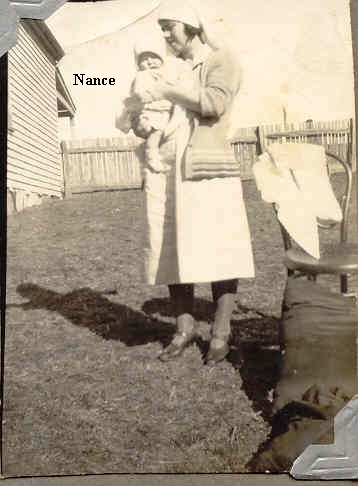 She was 29 years old, and had left her eldest three children in the care of relatives on the South Coast, and her five-month-old baby, Margaret “Nance”, was to be placed in the Infants’ Home that very day. Possibly, it was because the child had been in close contact with the highly contagious disease of TB. The photo above shows my older sisters holding a doll, and below, a photo taken the same day with a nurse holding a baby, which, I presume is me. Below is another family photo showing my elder siblings in front of the car which my mother Josephine is driving! 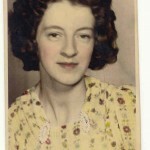 Josephine was entering a sanatorium for TB where she was certainly going to die in a very short time; as it happens, only twenty-four days later. She would be buried in a cemetery for TB victims, in accordance with the health regulations at that time, to contain such a contagious disease from the general community. The death of Josephine changed everyone’s life in our family. 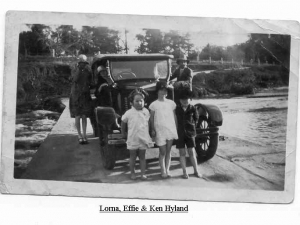 In 1936, I was discharged from the Infants’ home into the care of my father, Claude Vincent Hyland and went to live with his mother, Granma Amanda Hyland in Quaama. Here I went to school and the photo below from Quaama School, circa 1940, shows me on the far right, front row aged about six. My older sisters and brother went to live with other relatives and we did not meet up again until we were all adults. Quaama School, circa 1940. Nance Hyland is in the front row, far right. After reading the newspaper article and making contact with the Wollongong City Council, I have been provided with a copy of the burial records and other details about plans to restore the cemetery. Their report on the Waterfall Garrawarra Cemetery outlines a plan to conserve the site, contact families whose relatives are buried there, create a friends of the cemetery group and apply for future listing on the State Heritage Register. The report was tabled at the Ordinary Meeting of Council 27 August 2012, Item 4. See the report here. This report explains that the Cemetery is of significance as it provides evidence of early 20th century burial practices, including isolated burial places for those who had died of this terrible infectious disease. Waterfall was the only purpose-built facility for the treatment and care of TB patients in New South Wales. It opened in 1911 and over 2000 people were buried there up until the 1940s. The cemetery has not been maintained since that time, and is overgrown with vegetation. However, there is sufficient physical evidence to be able to interpret the site and allow the memory of those buried there to live on for future generations. It is hoped that the site may be opened to the public in the future. An extract from the Council’s report is provided here. Growing up with Granma in Quaama, I had little contact with my father Claude. I know that he had enlisted in the Army on the 22nd of August 1941 and was discharged on the 9th of October 1945 at the rank of Warrant Officer Class 2. I also know from a postcard dated 14 February 1942 and the photo below that he was in Egypt in the early part of the war, but I cannot remember any contact with him in Quaama. 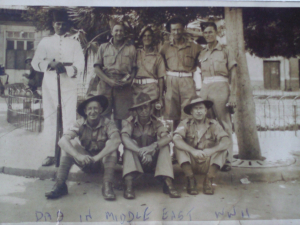 The photo below shows him sitting on the far left somewhere in the Middle East during this period. 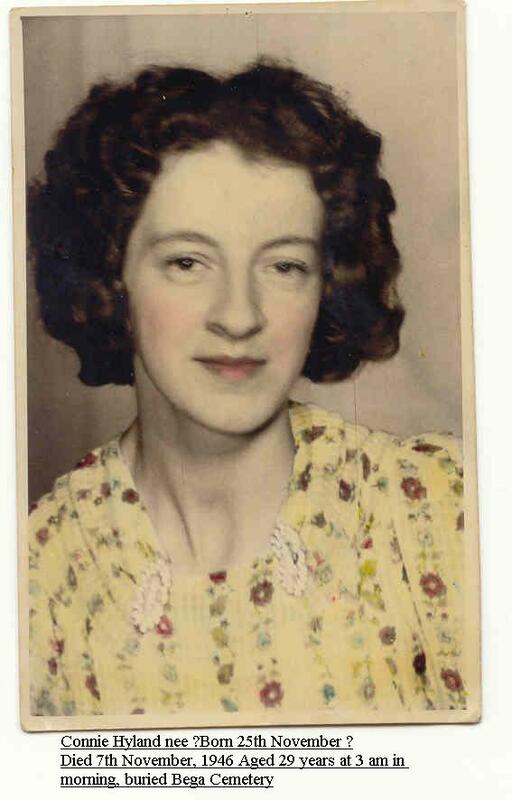 My father remarried in the early 1940s to Connie, pictured below. I left Quaama and we lived in North Sydney. TB was to strike my family again. 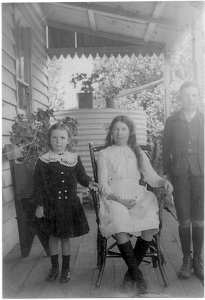 In November 1946, after having moved back to Bega aged 13, I recall caring for Connie who was now coughing up blood. At the age of 29, my step-mother succumbed to the disease. 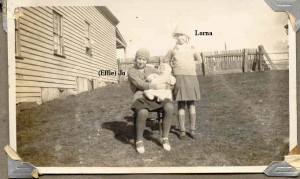 I recall standing at the graveside in my new Bega High School blazer, mourning another who had suffered an early death at the hands of the same dreaded disease that took my mother. 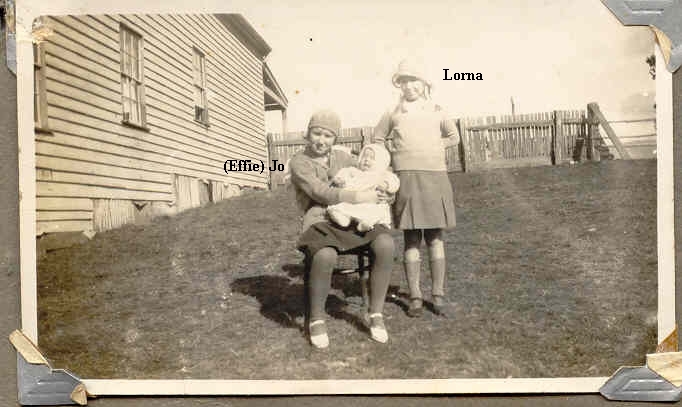 From the age of 13, I lived pretty well on my own, living sometimes with my father’s sister “Aunt Emma” in Quaama, and at the school hostel in Bega, until I finished high school. From there, I obtained a public service position in Canberra and went on to a secretarial career which took me from Canberra, to New Zealand, London, throughout Africa and back to Sydney. Back in Sydney, I married and had three children. My eldest daughter, Karen, unfortunately passed away from cancer at 35. As a family we travelled Australia very extensively, and have met many wonderful people. I am the proud grandmother of five grandchildren, the eldest of whom recently turned twenty. She has the middle name Josephine, after her great grandmother who lies in the Garrawarra Cemetery. I have been reassured to learn that there were chaplains at the Waterfall Sanatorium. The Council has provided me with an extract of the original burial records from the 1930s that were recently found in the hospital basement. 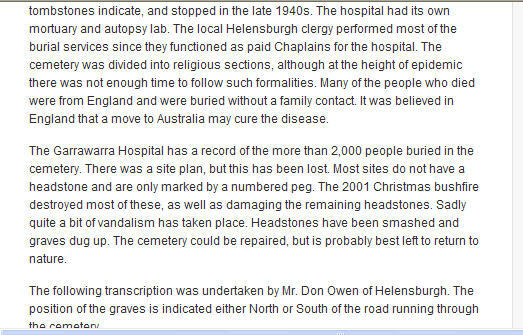 The burial records indicate that my mother Margaret Josephine Hyland died and was buried on 23rd August 1933, in row Q, grave eleven in the Church of England section of the Garrawarra Cemetery. The Reverend H G Robinson presided over her burial. The undertaker was a Mr R C Rowe. The witnesses were H Grieg and B Evans (names that appear on many other burials—presumably hospital staff). Regrettably, it appears there were no other mourners. I have much to be thankful for, considering how things might have worked out along the way. I was a five month old baby when my life was thrown into the unknown with the death of my mother. It is almost as though at this time in my life, Josephine has reached out to me from her final resting place, to assure me that she knows that we know where she is resting. On February 11th 2013, I will turn 80. A casual glance at a newspaper article led to this remarkable discovery and while I may not have known her, she is never forgotten. 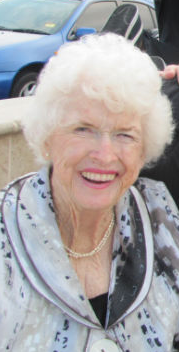 Nance Favelle died in Cooroy, Queensland, in May 2015. This entry was posted in Nance Favelle, Uncategorized and tagged History, Quaama. Bookmark the permalink.